This year, I googled “Savory Christmas Food Gifts” and I was super excited to find this recipe for Soft Pretzels. Although mine did NOT come out as full and cute as the ones pictured with the recipe, I can vouch that this recipe is tasty and spot-on. I’d never made dough before and it was really fun and easy. After my mom and I had made the batch, she mentioned that pairing them with a sauce would make the pretzels even better. I had to agree. And even though I absolutely abhor cheese, I’m a people pleaser — and I know how tasty that combo is claimed to be! So I headed to the store with this cheese sauce recipe, and whipped up a batch. I bought Tillamook cheese, because … Tillamook! Try this recipe! If you don’t have time during Christmas, this will impress on Game Day, too! In a large bowl, dissolve yeast in water. Add 2 cups flour, sugar and salt. Beat until smooth. Stir in enough remaining flour to form a soft dough. Turn onto a floured surface; knead until smooth and elastic, about 6 minutes. Cover and let rest for 15 minutes. Preheat oven to 425°. Divide dough into 16 portions. Roll each portion into a 15-in. rope. Fold each rope in half and twist two or three times; shape into a circle and pinch ends together. Place on greased baking sheets. Brush with egg white; sprinkle with salt or sugar. Bake for 12-15 minutes. In a small saucepan set over medium heat, melt the butter. Whisk in the flour and cook for 30 seconds, whisking constantly. Slowly whisk in the milk until no lumps of flour remain. Stirring constantly, bring the milk to a simmer over medium-low heat until it thickens, about 3-5 minutes. Remove the pan from the stove and stir in the shredded cheese until all of the cheese has melted. Add a pinch of salt, if needed. Serve warm. Leftovers can be reheated in the microwave on medium power at 30 second intervals. I can hardly believe it’s the holidays again! It’s been hard to squeeze in some making this year, but I can’t let my favorite season go by without crafting some homemade treats. This year, I really wanted to do something different — but with an insane work schedule, it had to be simple. So, I took to the internet to see what interesting options would yield from a “bark recipe” google search. So the name is quite a mouthful, but WOW — it was exactly what I was looking for. Something you can enjoy with your holiday blend coffee, something unexpected and bonus: this stuff is totally vegan, too! It’s sooo easy to make, you could whip some up today. Toss almonds and pistachios in coconut oil and vanilla, then mix with fresh ground coffee. I found a cute Christmas silicon mold on clearance last year (similar mold here), and knew it would be perfect. Melt your dark chocolate, pour into mold, and toss some coconut flakes on top. Make sure the nuts have cooled, add nuts to the top, and then drizzle more melted chocolate lightly on top. Place in the fridge for 30-60 mins., and voila! Once it’s out of the silicon mold, cut and package. This stuff tastes sooo good. And like the original author says, with almonds, dark chocolate and coconut, its practically health food, right? 😉 I packaged mine in cellophane as whole bars for a pretty presentation, and they were done! Thanks, Half Baked Harvest! This is gonna be some great gift-giving this year! Preheat the oven to 375 degrees F. Line a baking sheet with parchment paper or a silpat. Pour the almonds onto the baking sheet. Roast, the almonds halfway through, until the almonds are fragrant, about 10-12 minutes. Watch closely to make sure they don’t burn. In the meantime mix together the coffee grounds, cocoa powder and salt. Add the melted coconut oil and vanilla to a small bowl. When the almonds are done roasting add the pistachios to the baking sheet. Toss the nuts with the coconut oil and then toss them with the coffee. Toss well making sure the coffee grounds evenly coat the almonds and pistachios. It will seem like a lot of coffee, but this is what you want! Roast the almonds + pistachios until the coffee is fragrant and the almonds are starting to become crisp, about 10 minutes. Remove from the oven and let cool. Melt the dark chocolate in a double boiler or a heatproof bowl set over a pan of simmering water, stirring until melted. Pour 3/4 (leaving about 1/4 of the chocolate for drizzling over top the nuts) of the melted chocolate on to the prepared baking sheet that has been lined with wax or parchment paper and spread the chocolate out to form a rectangle, be careful not to make it too thin. Immediately sprinkle on half of the toasted coconut, then sprinkle on the almonds and pistachios, leaving out most of the coffee grounds. If desired, sprinkle the bark with a few tablespoons of the coffee grounds that were left on the baking sheet (I probably used about 1/4 cup). Add the remaining toasted coconut and then drizzle the remaining melted chocolate overtop of everything. Sprinkle with sea salt if desired. Refrigerate until firm, about 30 minutes to 1 hour. Peel off parchment, and break bark into pieces. I’m always up for doing a good deed for my fellow friends in Treatsland. 🙂 When these Red Velvet Oreos came out, my brain just naturally defaulted to the idea of doing some fancy chocolate covered versions of these in pretty gift boxes, but I was just kinda bored with that idea after doing so many for Christmas. 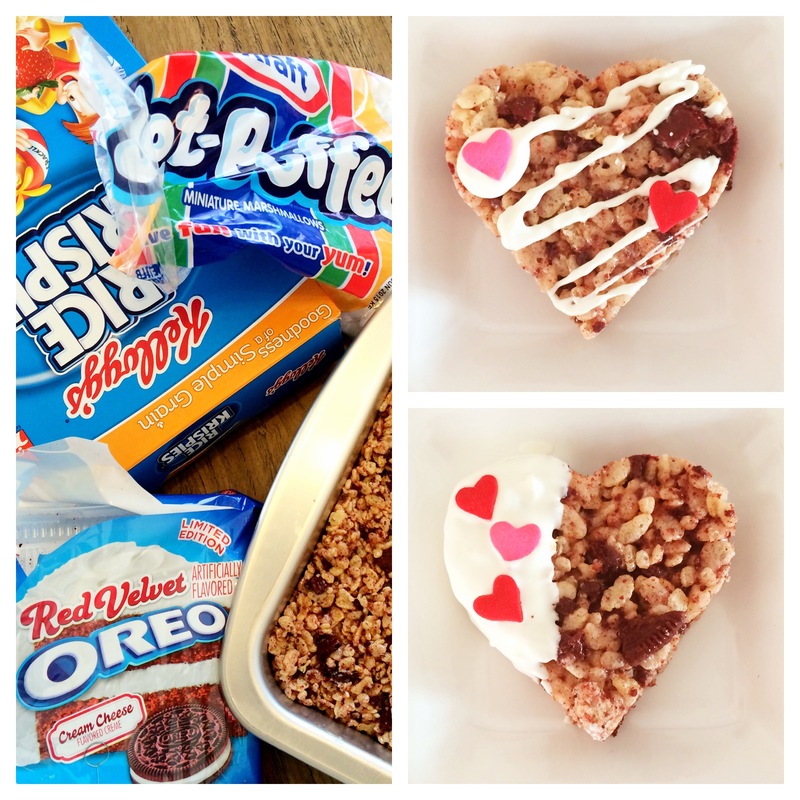 Then last night I got to thinking about all the receipes out there for Oreo Rice Krispy Treats and it dawned on me – I knew what needed to be done. I can’t help it – I have a weakness for Valentine’s Day. I’ve said before and I’ll say it many times over again – I love the day of love. All the haters that spew negativity with their whole “Valentine’s Day is just a Hallmark holiday …” and “Valentine’s Day is just a ploy for people to spend their money …” blah, blah, blah … should look at the focus of February 14th: it’s LOVE. Not chocolate. Not lingerie. Not gifts. Not even Hallmark cards. Focus on somebody you love and show them you care with a simple homemade gesture. I’ll stop there, but I will say — I’m a sucker for all the adorableness out there in red + pink, so I just HAD to make something. 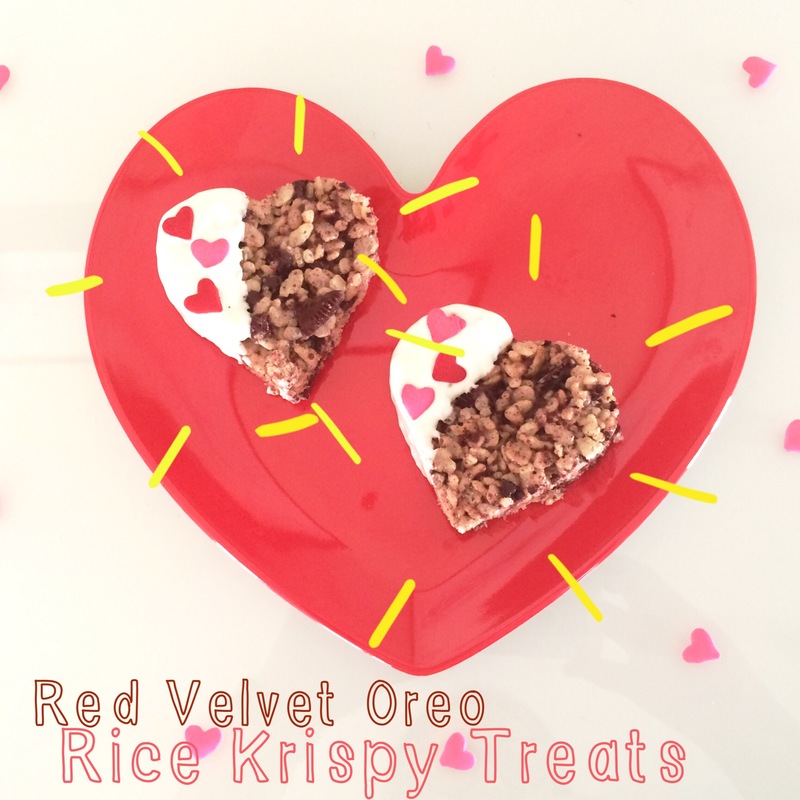 So here it is, as valentine-y as it gets: Red Velvet Oreos, Rice Krispies, Marshmallows, White Chocolate drizzle and heart sprinkles. The heart-shaped cookie cutter is just a nice (and very easy) touch, but they’d be just as full of love if you went traditional and cut ’em in squares. Make some yourself! Chop and mash Red Velvet Oreos. You want the Oreos to be a variety of sizes from chunky to finely crushed. Tip: Put Oreos in a large ziplock bag and crush with a mallet or wooden spoon to help keep the mess under control. 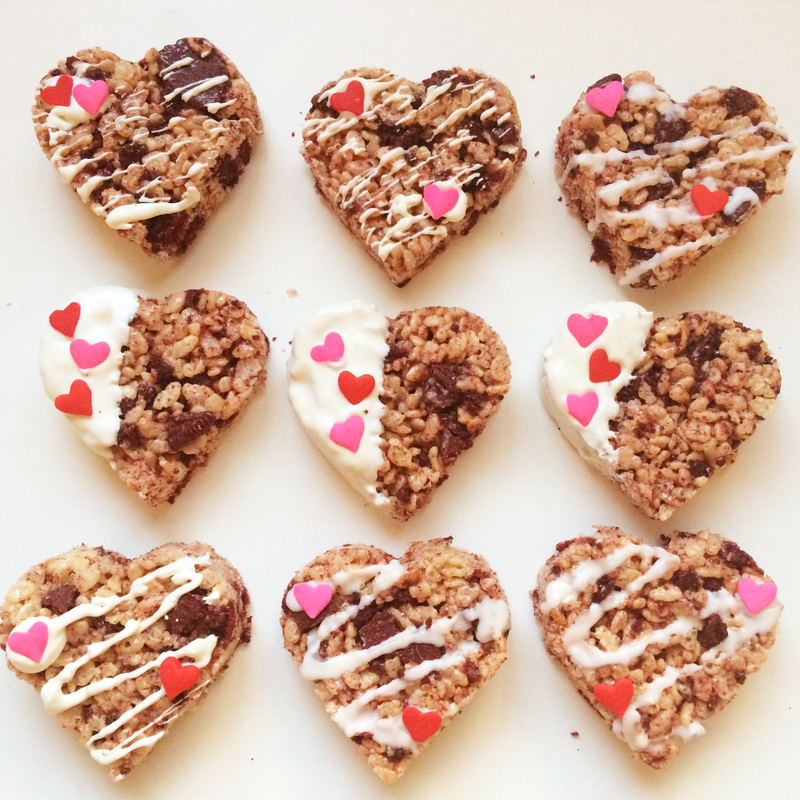 Note: When the rice krispie treats are cooled, you can use a heart cookie cutter to cut out heart shapes, or cut into traditional squares. Melt white chocolate to drizzle and add sprinkles if you want for a pretty finish and let set until hardened. I’m totally cheating and back-dating this entry, but I had to post the Red Bull + Vodka shots I made for New Years Eve this year because I’ll probably need to refer back to this again next year so I can stay up til midnight. I was buzzed, caffeinated and then some — these jell-o shots are no joke. They actually made the devil’s energy drink more palatable though, and hey — they are pretty impressive looking too. Thank goodness I found That’s So Michelle — there’s a zillion boozy shots you can make on her blog! 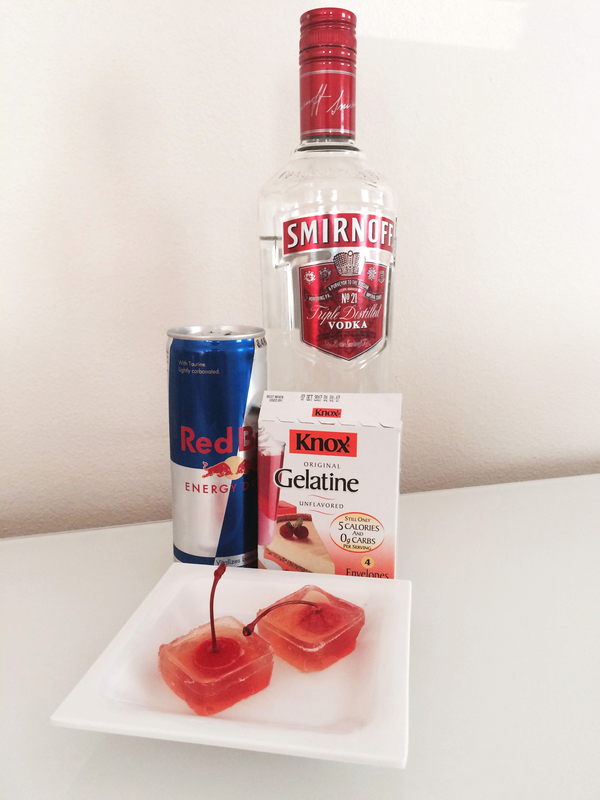 The Red Bull + Vodka Jello Shot recipe is hers, but I’m going to repost for your convenience. Make some — you can do it! You’ll feel like a total rockstar (sorry, wrong energy drink). YOU TOTALLY WANT THIS. You’ll use it for other projects anyway – especially more jello shots. Pour 1 1/2c. Red Bull into a medium sauce pan (should be almost the whole can). Sprinkle your 1 and 1/2 packets of gelatin on top (don’t stir) and let it sit for 2 minutes to activate the gelatin. Turn on low heat and stir in the gelatin until it all dissolves. Let the Red Bull get to a light boil and turn off the heat. Let it cool slightly and then add 1/2 cup of vodka. 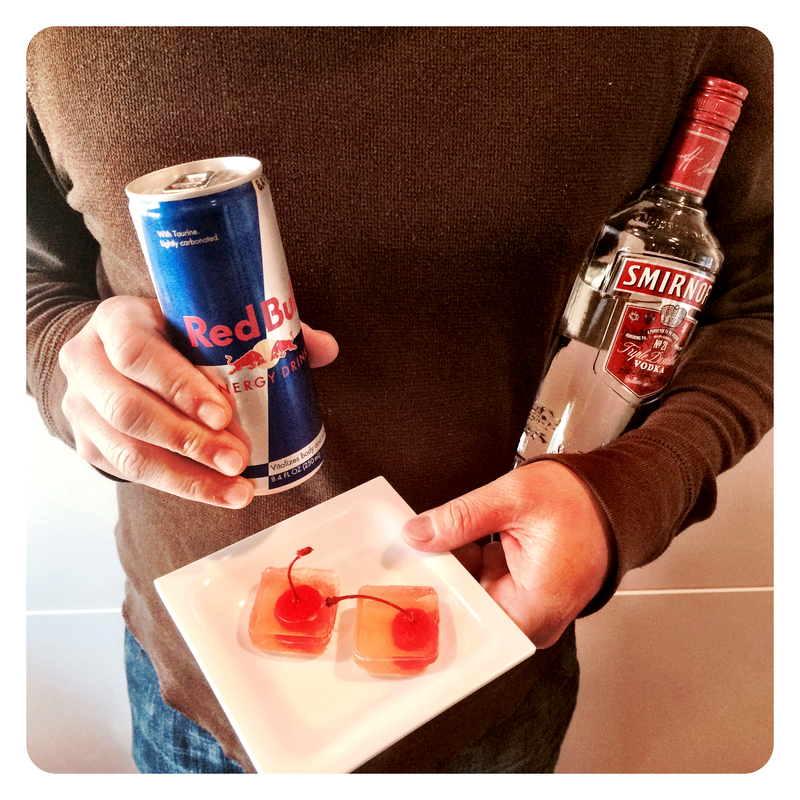 Pour half of your Red Bull jello mixture into your molds (or pan) let refrigerate and harden (about 2 hours). Place one cherry in each mold (or spread out an inch apart on in a pan) with the stem side up and cut side down, upright. Top with the rest of the jello mixture gently, not disturbing the upright cherries. Let refrigerate over night. Carefully, take a butter knife and edge around each mold to help release the shot. Pop them out and serve. Tip: Michelle says to lightly grease your serving tray with cooking spray or coconut oil before serving so the shots don’t stick and break when people try to pick them up by the cherry stem. I just lined my serving tray with wax paper. 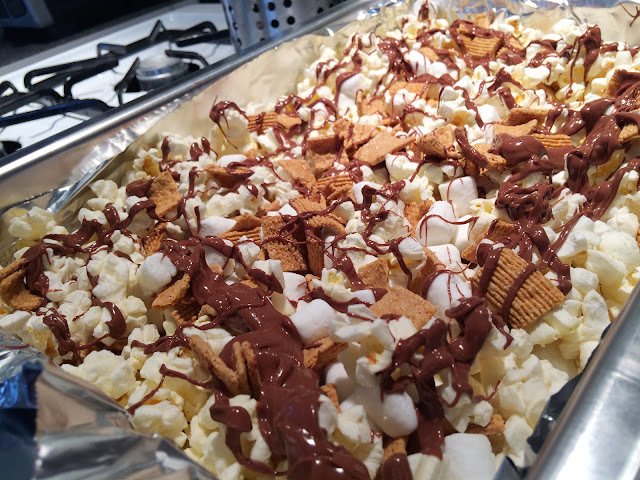 In honor of the biggest night celebrating movies, for your consideration: S’mores Popcorn. Four ingredients. Five minutes. You can do this. Not gonna lie, Four-Eyed Girlie’s had her hands full lately. I’ve been out of the kitchen and trying to whittle the waistline, so I haven’t been up to my usual shameless indulgences. But it’s Oscars Night people, and I need a snack. Just like Amy Adams isn’t showing up in her usual jeans/t-shirt combo, I’m not munching on the standard carrot sticks + hummus. 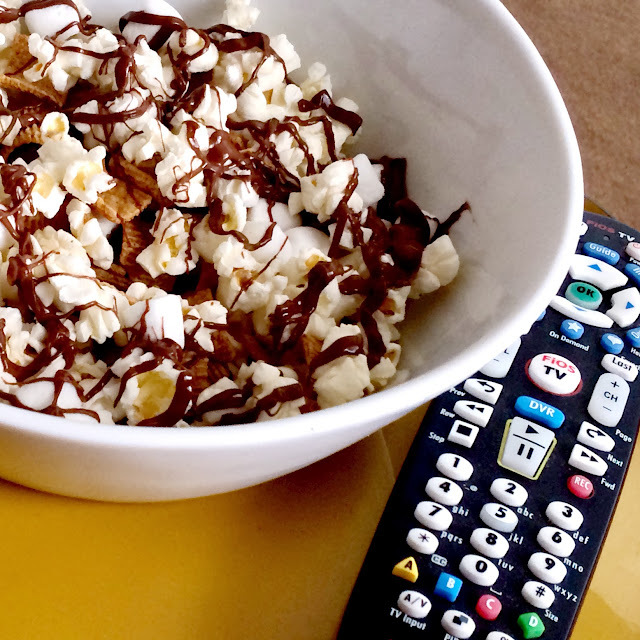 I decided no night honoring the movies was right without popcorn, so I went on a frantic internet search to find out how to take it to the next level. All I needed was microwave popcorn, marshmallows, golden grahams and chocolate chips. Thank you, Kellie — I’m soooo glad I found your blog, Nest of Posies. Let chocolate set/harden and enjoy! Happy New Year! Excuse the Christmas packaging, but I’m a little late on posting this. Couldn’t let it slip by though – this would be a delicious addition to your party tables tonight. They’re quick, easy and fall right in line with everybody’s mindset of staving off sweets after the holiday over-indulgences. You can make these for the party or package them up to give to your friends to start off the new year. Enjoy! Beat the egg white until nice and foamy. Mix in all spices. Add nuts and stir to coat. Bake nuts in a single layer on an ungreased baking pan. Bake for 20 minutes, pull ’em out and give ’em a stir. Let nuts cool completely and store for up to two weeks. 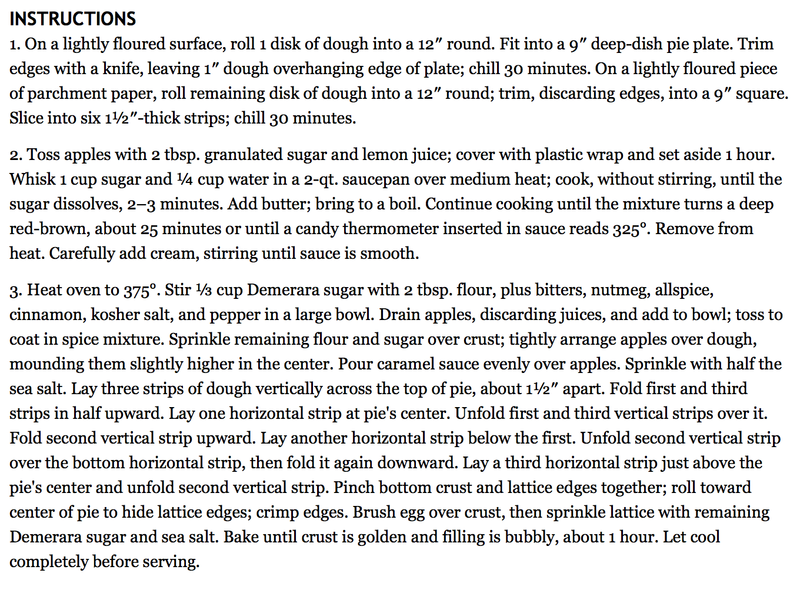 Notes: It was recommended to double this recipe and use 40 oz. of mixed nuts and 40 oz. of cashews. I have to second that recommendation. Cashews rule! Packaging: The sky is the limit! Use treat bags, brown paper bags or mason jars! I found these clear cylinder containers from my local Cake Supply Store. Similar containers can be found here. When I found out that my friend Danny had been given the task of making Saveur Magazine’s Salted Caramel Apple Pie for the Thanksgiving Dinner she’d be attending, I was all up in her business asking if I could help. I’ve never made a pie before and I was eager to check that off the bucket list. 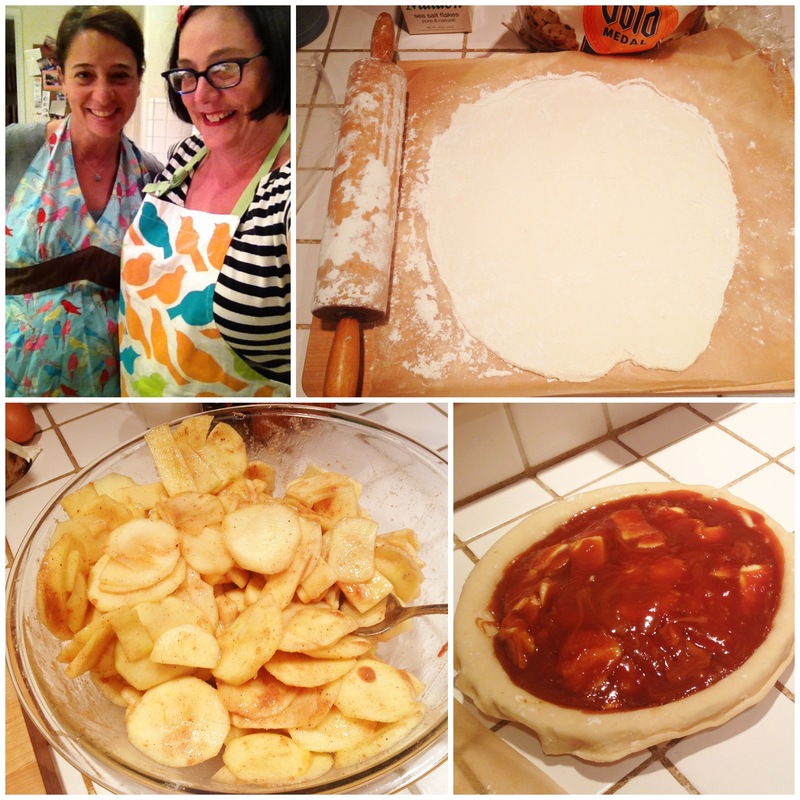 Kicking off my pie-making career with this recipe was one heck of a start, but I’m happy to say that we climbed Pie Mountain and each had our own pies to show for it … barely. Things got off to a good start: we’d donned adorable aprons, we’d made our flaky butter pie dough, apples were sliced and doused appropriately for their 1st phase of marination and the remaining steps ahead of us sounded delicious. But wow, Saveur sure knows how to make a recipe convoluted — there were only three steps numbered in the recipes, but each step had many more tasks within the paragraph! With two sets of eyes (and two pretty sharp brains) you’d think we’d catch everything, but each time we referred back to the recipe, we seemed to find something we’d missed. No big deal, we made a quick jaunt to the grocery store for a package of pie shells (oops, the receipe makes two crusts, but we needed two for one pie) and heavy cream (no, the 4 sticks of butter weren’t enough I guess). Upon our return, the homemade dough was properly chilled, so it was time to roll it out. Danny didn’t mess around, she busted out her ruler and took cutting those 1.5″ strips seriously. Our apples had been doused in round two of their marinade, and they were ready to get into that pie crust and get cozy with the salted caramel sauce we were making. The caramel sauce turned out just as described … deep reddish brown and seductively shiny-looking. That caramel was almost a lacquer once it got inside of the pie pan. 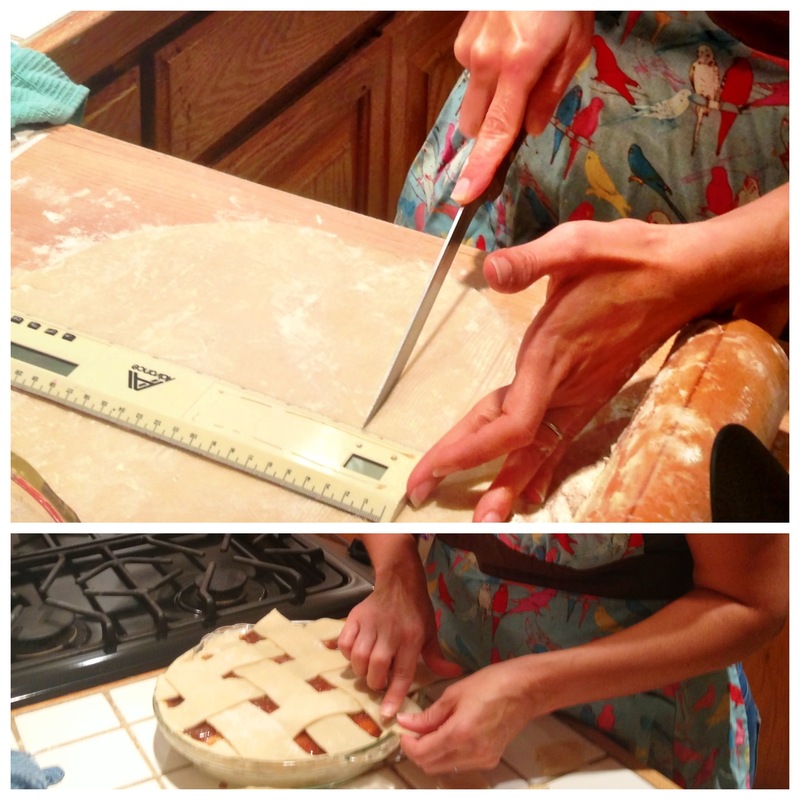 We decided to both use one homemade crust and one store-bought so we could each taste the fruits of our labor. 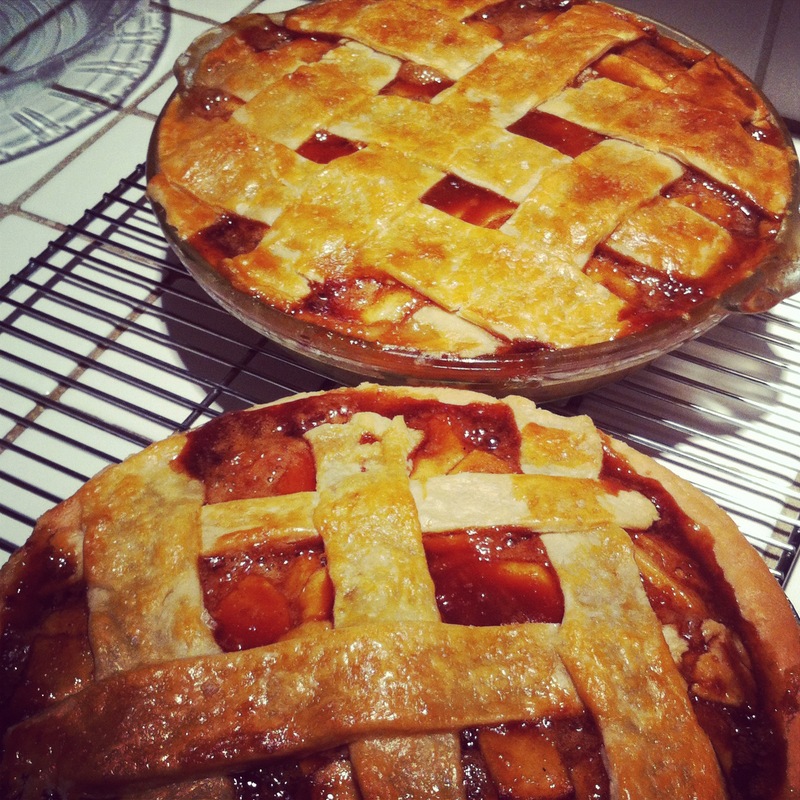 Once the lattice detail on top was complete, we were ready to throw these babies in the oven. At the end of SIX HOURS, we were ready to call it a night … it was late, we both were semi-delirious, and Danny assured me we both didn’t have to wait for them to bake, I could swing by in the morning and pick up my pie before dinner. Poor Danny. Apparently that’s when things got crazy. Suddenly, smoke was filling the kitchen, and when she looked in the oven, all the filling was bubbling and leaking outside of the pie pans. WTF? She was able to keep her smoke alarm from sounding after midnight and miraculously — she also somehow managed to save these pies from destruction. They were completely intact and edible, even if they had a sloshy filling. Well, somehow we managed to forget about that heavy cream that sat in the fridge; apparently, we were supposed to have added it to the caramel sauce after taking it off the burner. I think we were being so careful to not burn the caramel, we just plum forgot. I think that forgetting the heavy cream is what caused our caramel sauce to melt back down to its buttery-pure sugar state and eventually, bubble and run over at high temps in the oven. My thought is without the cream, the sauce couldn’t congeal and stay creamy and thick in the filling. Yes, the pie was tasty. It was flavorful and delicious, but instead of sticky gooey caramel sauce intermixed with honey crisp apples, we had more of a caramel apple marinade inside. Was making your own crust worth it? Tough call. It was my 1st time, and I don’t have much to compare it to, but based on this experience — no. Instinct told me that the consistency wasn’t quite right, but it still worked and it still tasted great. However, the difference between the store bought and homemade wasn’t worth the hassle in this particular case. Should I make this pie myself? Why not? I will say, I felt very accomplished. I’ll also say that it was a very testy recipe though. If you do take on this task, allow yourself a lot of time and do it with a friend. It definitely took the stress off and many f-bombs in the kitchen were replaced with laughs! At the end of the day, I made a pie, it tasted good, and I had a blast with my pal, Danny. It was a win all around. Be sure to let me know if you brave this recipe — click this link to get on your way!